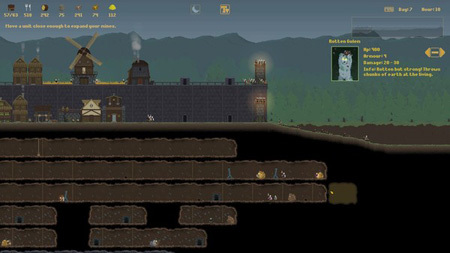 Grim Nights is a side scrolling, pixel art, survival strategy game from Edym Pixels. Gather resouces, expand your village, explore the underground for riches and train soldiers to defend against hordes of the undead. The game features random generated faces, names and abilities for your villagers. There are nine different unit types to train, 13 unique enemies, three unique bosses. If you get stuck in the game, check out the video walkthrough and gameplay for the game. This entry was posted in PC Games, Walkthrough and tagged Grim Nights Cheats, Grim Nights Game, Grim Nights Gameplay, Grim Nights Guide, Grim Nights Hints, Grim Nights Review, Grim Nights Solutions, Grim Nights Strategy, Grim Nights Tips, Grim Nights Walkthrough by Marvin. Bookmark the permalink. Copyright © 2019 Marvin Games. All Rights Reserved.